Lasagna with pesto sauce and stracchino cheese is a vegetarian recipe, typical of Italy and suitable for those coeliacs that don’t eat meat. 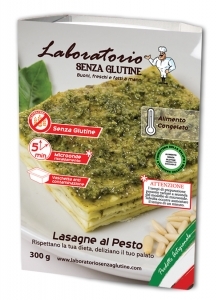 Moreover, this lasagna is handmade and preservative free. Bechamel (milk, butter, rice flour), stracchino cheese, dough (rice flour, eggs, rice starch, potato starch, corn starch, guar flour E412, extra virgin olive oil, pesto sauce 9,7% (sunflower oil, basil, cashew nuts, extravirgin olive oil, grana padano cheese, potato starch, salt, pine nuts, pepper), parmigiano cheese.